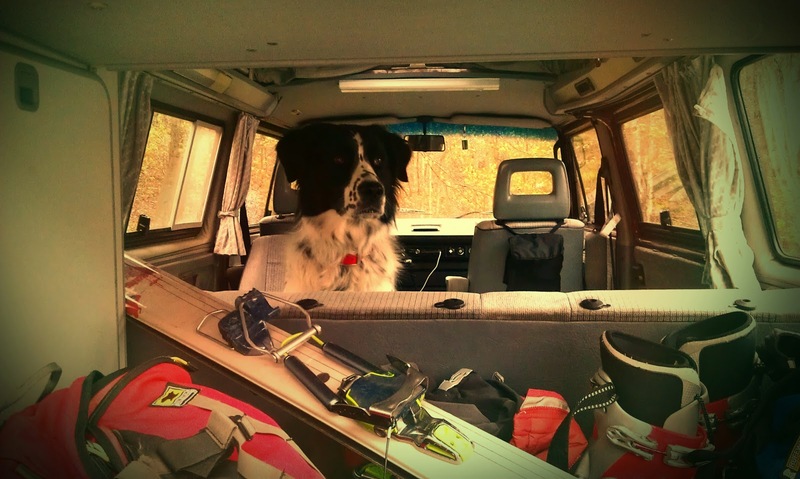 On a balmy 75° afternoon, I once again enjoyed the strange springtime ritual of loading my ski gear into the Vanagon for a weekend on the snowy, upper reaches of Mount Washington. Parker was my copilot and by 8:30pm, we connected with friends at Flatbread Pizza Co. in North Conway to enjoy some of their always-delicious and creative offerings. The topic of conversation was John's imminent race in the Tuckerman Inferno Pentathlon. This year, I was there only for race support, along with Tim and Syrah, while John planned to tackle all five events himself. 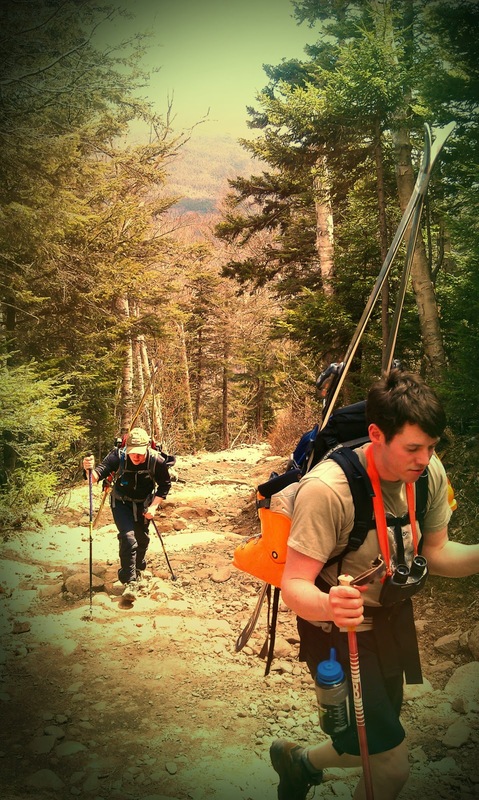 They include: 8-mile run, 6-mile whitewater kayak, 18-mile bike ride, 2.5-mile mountain hike, and finally, a slalom race in the Left Gully of Tuckerman Ravine. John had a strong finish in the road race and after a difficult transition into his cold-water kayaking gear, he disappeared around the first bend of the river. Tim, Parker, and I returned to the Vanagon and made our way to the kayak-to-bike transition, and there we waited. And waited. And waited. Just as we were beginning to seriously worry, John appeared, but not from the river's edge as expected; he instead strolled down from the parking lot behind us. Shortly into the kayak race, he became lodged on a rock and while attempting to free the boat, lost his paddle (a borrowed carbon fiber paddle!) to the fast-moving current. Down the river it went, never to be retrieved. A sympathetic bystander witnessed the incident and drove John to meet us at the finish line. Discouraged at the obvious disqualification but not yet entirely brokenhearted, John decided to continue—he had, after all, trained for many months—and complete the remaining three pentathlon events. His spirits were lifted as soon as he launched into the bike race! It was a beautiful, mountainous course winding through scenic Pinkham Notch to the base of Mount Washington. But luck was not on John's side that day. About one hundred yards into his ride, the rear tire exploded as he crossed a gravelly section of rugged New Hampshire road. And that truly marked the end of John's 2012 Inferno efforts. While the race wasn't meant to be, the weather was unexpectedly exquisite. We decided to make the most of the afternoon and after packing our ski gear into the Vanagon, we set out along that very bike route to the start of the Tuckerman Ravine trail. It was a sunny, hot, and sweaty ascent. 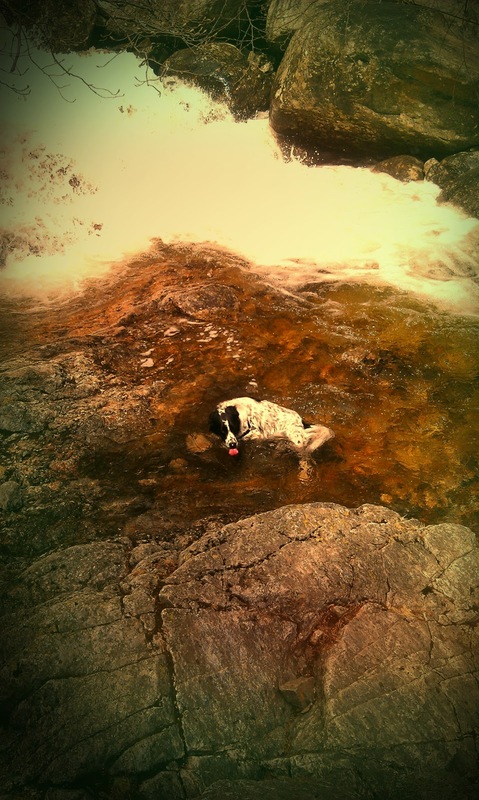 Only Parker was brave enough to seek relief in a churning pool of frigid meltwater. Due to the extremely warm temperatures and growing number of natural hazards—cliffs, waterfalls, crevasses, and dangerously undermined snowpack—ski routes were limited. The slalom race was happening in Left Gully, so we opted for Hillman's Highway, a longer run just left of the bowl-proper. 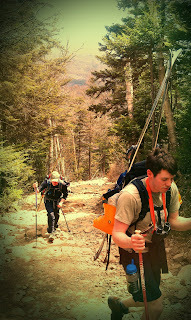 Parker remained steadfastly by our side as we gasped and sweated up Hillman's steep bootpack. Hillman's Highway is split by a band of rock three-quarters of the way up, and we decided to stay right on the narrower and steeper of the two paths. By the looks of it, that side had not been skied all day and our efforts were rewarded with soft, fresh corn snow from top to bottom. As the shadows lengthened we knew it was time to hike out. Skis, boots, and packs returned to our achy shoulders, and we steadily trudged three rocky miles down the Tuckerman Ravine trail, where Ruby the Vanagon patiently awaited our return. After some cold beer, music, and R&R at the Vanagon, we all piled in with visions of 20oz brews and heaps of chili-topped nachos at our favorite post-Tucks establishment, Moat Mountain Smokehouse and Brewing Co. Once again, Moat didn't disappoint. The tall beers were the prefect medicine for my stiff, bruised shoulders and the nachos helped replace some of the days' countless burned calories. From Moat, we returned to the Wildcat Inn and Tavern, where spirited discussions continued into the night. Eventually John, Tim, and Syrah retired to their rooms and I joined Parker in the Van. We spent the night in Westfalia comfort under the steady pitter-patter of rain in a far corner of the inn's parking lot. 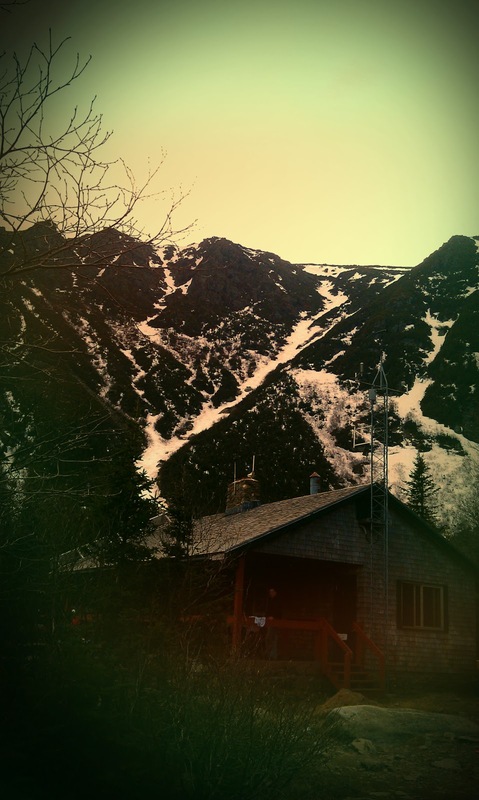 I'm already looking forward to Tuckerman adventures next spring, when we'll go early enough in the season to enjoy the twists and turns of the John Sherburne Ski Trail all the way to the parking lot, altogether avoiding that long, painful hike down. Nice photos Jeff, I was too wiped out to notice you even taking them! I unfortunately forgot my camera. These are just phone pics! It sure was easy making sandwiches in that Vanagon! that was a damn good sandwich! I wouldn't have survived that bootpack without it. Thanks for the updates. Always enjoy checking out your page. 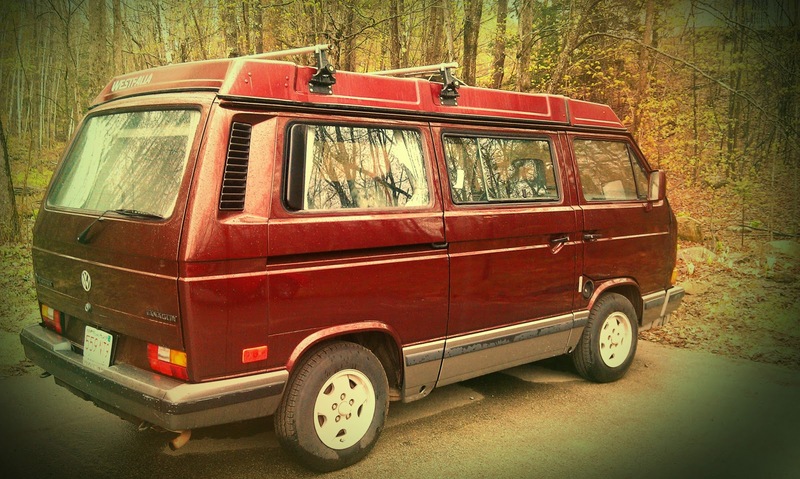 I have the same Vanagon as you (except it's an Auto) and live in the Boston area.